A patient suffering from chronic ankle pain and arthritis years after a traumatic fracture and surgery, turns to Platelet-Rich-Plasma (PRP) therapy to ease pain. Following years of pain with ineffective treatments including surgery, a patient has turned to regenerative medicine treatment with PRP to alleviate the nagging pain. Surgery with hardware, therapy, and numerous medications did not alter the pain. 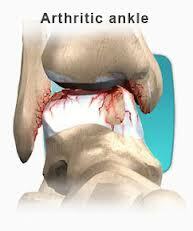 In fact, it progressed with time as the arthritis progressed in the ankle joint. Dr. Lox preformed a complete evaluation and no occult processes were identified such as avascular necrosis (AVN). It is important to fully evaluate each patient as undiagnosed disorders that have been untreated must be identified. Osteonecrosis or AVN in the ankle must not be missed. in this case regenerative therapy was implemented and Following 1 PRP treatment significant relief greater than 85% was achieved. Functional level improved with walking greater distances, and improved standing tolerance. 1 year after the procedure, benefit was still noted greater than 50% above baseline pre-treatment level. Accordingly, the patient opted to repeat the PRP and 1 injection prompted improvement again was noted at 90% above baseline at 1 month. Satisfaction was stated, and of all treatments to date it was stated that the PRP had been the most effective. For more information regarding Platelet Rich Plasma (PRP) and Stem Cell Therapy contact Dennis M. Lox, MD,.